On Friday 27th June children and staff welcomed Mr Denis Frere-Smith, a peripatetic music teacher, into school to give an instrumental demonstration. 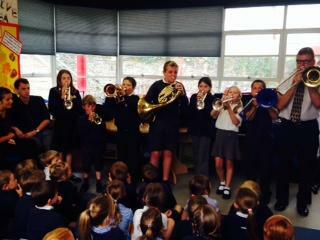 Mr Frere-Smith brought a variety of brass instruments to show the children including a trumpet, cornet, saxophone and trombone. 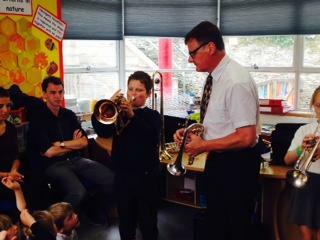 After he had finished playing, Mr Frere-Smith gave the instruments to some of the children who wanted to play them. 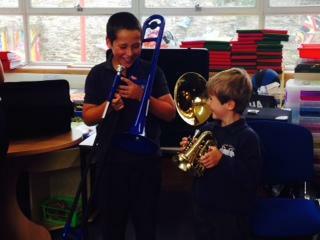 We hope that the children enjoyed their musical morning and that perhaps some of them may be interested in having instrumental tuition.